Synkinesis is a condition that occurs as a result of abnormal facial nerve regeneration after facial nerve injury or Bell’s palsy. Meaning “simultaneous movement,” synkinesis results when facial nerve fibers reattach to the wrong nerve and cause undesired facial movements. Babak Azizzadeh, MD, FACS, of the Facial Paralysis Institute is known around the world for his facial paralysis expertise and offers information about diagnosing synkinesis, as well as treating the condition. Diagnosing synkinesis involves a careful and thorough examination by a facial paralysis expert like Dr. Babak Azizzadeh. Although the severity of synkinesis varies from one patient to the next, there are commonalities among synkinesis patients. Synkinesis patients tend to differ from true facial paralysis patients in that they usually have some visible facial movement and good facial tone. Also, the corner of the mouth tends to go sideways or down rather than up. One of the most common side effects of synkinesis is that the eyes close when the patient smiles and may twitch when the patient laughs. Synkinesis can also cause chin dimpling and muscle spasms, along with tightness in the cheeks and neckbands as well. Dr. Azizzadeh will take his time during your consultation to evaluate your condition before diagnosing synkinesis. Neuromuscular retraining with physical therapy involves specific careful exercises and massage to reteach the facial muscles. Physical therapy for synkinesis generally does not include electrical stimulation, as it may for other medical conditions, because electrical stimulation can irritate the already overactive muscles. 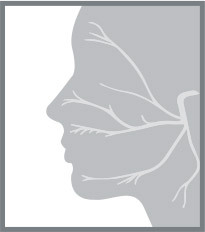 Botox has proven to be a great method of treating synkinesis symptoms. Usually used in conjunction with physical therapy, Botox relaxes the hyperactive muscles to release the tension and improve facial symmetry. In addition, facial fillers can be used with Botox to provide optimal improvement in facial symmetry. Surgery for synkinesis is only performed if Botox and physical therapy have not proven effective. Although the specific surgery will depend on the individual case, static suspension is often used to elevate the corners of the mouth. Static suspension is a surgical procedure that helps improve facial symmetry as well as other side effects of synkinesis. 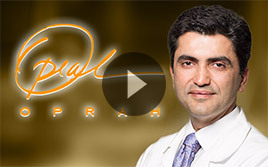 Dr. Azizzadeh generally uses tensor fascia lata (tendon from the outer thigh) to create symmetry of the lips. The surgery involves a small incision in which the tensor fascia lata is placed under the skin and attached to the bone on one end and the corner of the mouth on the other end. The procedure generally results in a small, hidden scar and significant improvement in the appearance of the patient’s smile. Schedule a consultation with Dr. Azizzadeh today to see if you are a candidate for static suspension or another surgical procedure to improve facial symmetry. 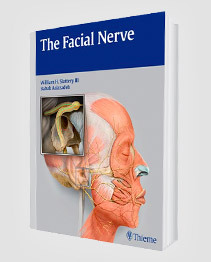 If you have or have had Bell’s palsy or a facial nerve injury, it is important to seek medical treatment for the management of symptoms and diagnosing synkinesis. 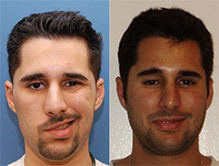 Dr. Babak Azizzadeh is a facial paralysis expert who would love to meet with you to discuss and treat your synkinesis. Call Dr. Azizzadeh at (310) 657-2203 today to schedule a consultation. To learn more about diagnosing synkinesis, contact our office.